Build Like A Boss: Low Light Photography and Practical Light Effects, Guest Tutorial Tuesday! Low Light Photography and Practical Light Effects, Guest Tutorial Tuesday! Hey guys, Simon Liu was kind enough to let me share a tutorial of his on the blog. In case you don't know him, Simon is a TBB Blogger, the founder SHIPtember and The Micro-GARC Coordinator. Warning, this is not for the faint of heart, many of these results can be done by simple photoshopping, and it might be much faster. But do you get a better result? That's up to you, but I believe if you can do it for real, it looks that much more real (or even surreal). Let me preface and admit that I am not a photographer, I have never studied photography, and while I'm somewhat familiar with the concepts and science - I am by no means an expert. What I am is lazy - I know the bare minimum to get cool pictures. So what does that make me? I would say I have practical experience. I have a bag of tried and true tricks that have historically worked for me. 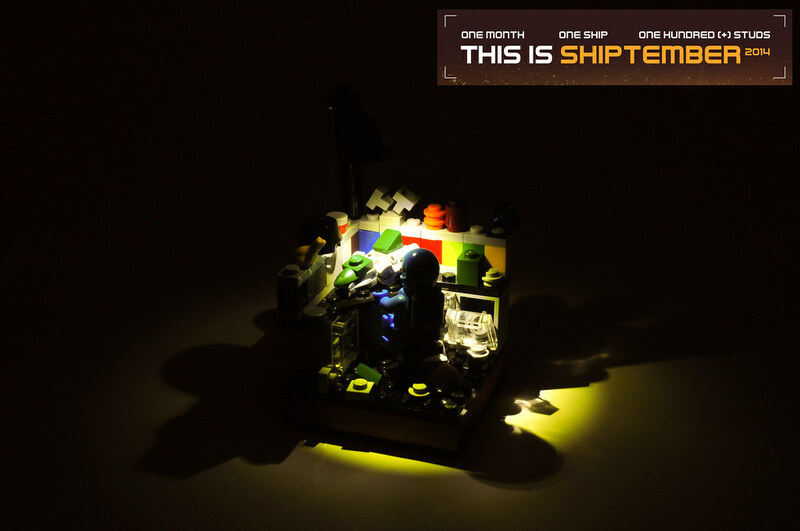 The object of this tutorial is not to talk about the theory of low light LEGO photography, but to share my practical tips and a layman's how-to guide to shoot in the dark. Ambient light - This is the amount of light in the room anywhere from bright, to low to even none. Embedded light - lights that originate within your actual build. Special lighting - using coloured lights to change the mood of the picture. Black Lighting - special case of special lighting, with glowing results! Wait, build? I thought we were talking about how to shoot and using fancy light? Well we are, but before you photograph your build, you have to build it! And before you build it you have to PLAN on how to build it. This is probably one of the more important keys to low-light LEGO Photography. You have to build your MOC to suit what method you may use. If you're going to use embedded lights, well you have to put them in ahead of time! Do you have small lights? or big lights? You obviously can't put a massive light into a micro, but you could put in small lights with wires hanging out (to Photoshop out later). 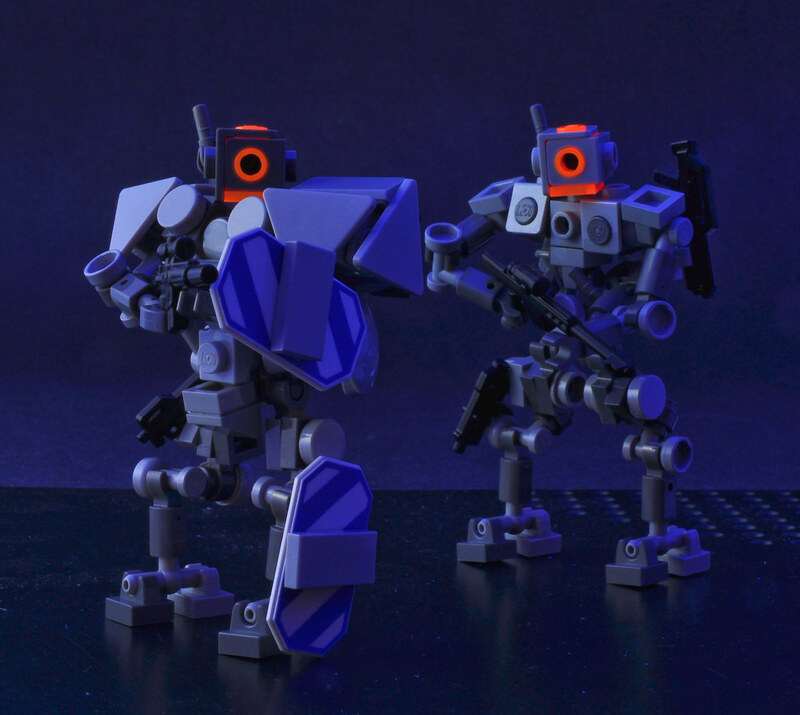 Or if you're going to use black-lights, well you need to use one of the LEGO elements that glow! Other things to think about when you're building - which angle(s) will you be shooting from? Do you need to hide wiring? or even where the lights will be. Do you want to actually see the LED/Light bulb? or do you want it hidden/away from view? Don't forget that if you're shooting at really low light, even the weakest light will wash out all your other details - so light placement will be key. As you start off, remember: patience. This will take time for you to set up, to photograph correctly, and often rebuilding to get things 'just right'. Before you start there are few things you need to have, and know how use. This is the most important thing to have. It takes time to set up, it takes many shoots, and it can be frustrating. So have patience and just know that it will look cool in the end. Most cameras, even the smaller pocket cameras have the ability to set the shutter speed - which is the amount of time your camera 'takes a picture'. This will become important, as the darker the room, the longer picture you need to take. Some cameras will have a "M" or Manual setting that lets you configure the shutter speed, as well as FStop (or aperture and other fun things). Alternatively you might have a "S" (Shutter priority) setting that controls just that, and the rest are automatically. Note that the FStop is also useful for certain effects (see DoF tutorial). If your camera doesn't have a "M" setting or "S" setting your best bet is "night time" or "stars" setting - that's the camera's setting for low light, not the best, but it can do in a pinch. If you have ever tried to take a picture without a flash in a dark place, you'll know why you need a tripod. Simply put, our hands aren't steady enough to hold a camera to take shots in the dark. Even braced against something we vibrate the camera too much and it becomes blurry (unless you're into that). Any tripod will do, it doesn't have to be super fancy, or honestly you could use a stack of books, it just makes it harder to reposition and set up. But for me, I have cheap ball joint tripod that lets me quickly rotating the camera and change angles. Your camera probably also has a timer function (think family photos where your dad sets the timer and runs back into the picture). I would recommend learning how this works on your camera and set it to the lowest possible setting (3s usually). Why? Because when you take the picture, you push down on the camera, that causes vibration and can be picked up on your picture - especially if you don't have a very good tripod. This also allows you to free your second hand in case you need it for something else (like holding up a light source!). Depending on how you're going to light your build, you may need external light sources, you can use your standard lights, LED's, flashlight, laser pointers, black-lights IR from remote controls, whatever creates light that is visible to a camera. Try different things for different effects! Having the camera on timer also frees up your hands so you hold your light sources. Ironic eh? But a light tent is still useful. The purpose of a light tent is to disburse light over your build, this rule still applies, you're just not applying AS much light. I will now go through each of the different lighting techniques. Of course for maximum fun you could apply several of these techniques together to create a master piece! This is the easiest and most important trick that you need to master. Simply put: turn down/off the light. This by itself isn't usually overly useful - if you set your camera right it is almost the same as taking a picture with the lights on. The key here is to change the shutter speed of your camera to take a longer exposure picture. A regular picture is around 1/60 of a second. If you dim the lights, your picture might be 1 second or longer. Why this is so important is when you start using the other lighting tricks. You do this to make the OTHER lights seem brighter than they really are. So a very dimly lit fireplace, using normal room lights is barely noticeable. But if you turn off the room lights and set the shutter for 5 seconds, it becomes a roaring fire. Knowing how to set the shutter speed is also useful for every day MOC taking pictures. Many people prefer to take the MOC's outside to photograph, the sun provides extremely bright light. But if you know how to set your shutter speed accordingly you don't need to wait for a sunny day! Small LED's such as the Power Function lights or third party Lifelites. Larger less specialized lights can also be used - these are far cheaper than the above and work far better lighting up large areas - downside is you need a lot of space to hide these. Note how changing the ambient light changes the entire image feel. The inner ring of the station is lit up by LED light bars that from dollar store. The rest are light bricks, and Lifelites. Now you can see that if I retook the second picture with a longer exposure, it'd be just about right. But the first shot, if I decreased the shutter speed (faster picture) it would be too dark, and the light would still be too bright, so I would have to turn up the ambient light to compensate. The black light is actually sitting under a glass table, and there are 8x8 grill plates under each vat and a pile of neon orange dots and pieces to create the glow. Pro Tip: Get a good black-light. Stay away from the ones that fit in the light bulbs, they're rubbish (usually), get a good old fashioned tube one, they're by far the best. Another trick is to shine a light on specific parts of a build. This obviously should be done in conjunction with low ambient light. You can use this to flush out or highlight the subject of your build, while not ruining the lighting effect behind it. Here, because I had the gate glowing from black light I didn't want to wreck the feel by lighting it up too much. But I wanted to make sure the ship is the subject. So I took a little LED flashlight and lit up the ship. When you shine a spotlight, make sure the light doesn't hit anything else! Direct your light up and away from your build whenever possible. The other method is using harsh light in one direction to forcibly create shadows. Not overly useful, but it can create some stark pictures. This entire build is light-bley but you can clearly make out the details. Last but not least you can use some special coloured lights - like black light, or simply coloured filtered in front of lights. In the past I have used trans coloured LEGO pieces in front of a flash light to add a glow to a build. Or you could even prop up a laser pointer to create some pew pew pew action! No ambient light - pure darkness. Special light- the background (white backdrop) was actually lit with a light trans red plates to create a sunset type feel. So there you have it. Every single one of my tricks. It's not the easiest thing to do, but it's not really that hard either. The key is patience. Take the time to experiment and try new things. Wow Simon, that is one comprehensive tutorial. I'll be sure to read through the whole thing and learn from the master of lighting effects! I love the Laser Pointer. I usually use a green laser to pop balloon, light matches, burn plastic etc, which can always bring me a lot of joy in my life.